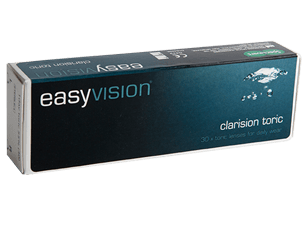 easyvision daily clarision toric lenses offer the convenience of single-use lenses and correction for astigmatism at outstanding value. These lenses benefit from a handling tint, making them easier to see while putting them in and taking them out. €41.25 per month (30 pairs) by direct debit. (Alternative quantities available. Minimum purchase 3 months.) Available exclusively in-store. We’ll give you a professional and thorough eye examination from a fully qualified optometrist. Have a free pair of glasses from our €59 range or a pair of designer frames from just €70. If you pay for your contact lenses by direct debit, all your aftercare checks are included at no extra cost. Our simple, free delivery service means you can receive your lenses and cleaning solutions (if required) direct at an address convenient for you. At Specsavers, we want you to be completely happy with your contact lenses. If you have any concerns within three months of the date of purchase, we will put it right. No quibble, no fuss. Free glasses with contact lenses: Cannot be used with other offers or exchanged in part or whole for cash. Initial 3-month payment required from new easycare direct debit customers. One free pair of €59 range glasses with scratch-resistant single vision lenses every two years. Current prescription required. Alternatively, an eye test will be required at our standard charge. easycare benefits are redeemable only by named scheme member. Please enter the brand name of the contact lenses you wear.